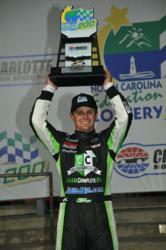 As Friday night came to a close at the North Carolina Education Lottery 200, and Justin Lofton’s first ever NASCAR Camping World Truck Series Victory Lane celebration concluded, College Complete (http://www.CollegeComplete.com 877-543-2655) partner Star Coach Race Tours (http://www.starcoachracetours.com) hosted a surprise post-race after-party to celebrate the win. Since 2011, College Complete has been working exclusively with Star Coach Race Tours to provide all inclusive on site hospitality at NASCAR tracks. Race after race, the employees at Star Coach, and its founder, Joel Labute, watched Lofton come closer and closer to a win. And this past weekend, they were together again in Charlotte, NC, this time celebrating Justin Lofton’s first NASCAR win. Throughout the week, the College Complete team enjoyed top-notch on site accommodations, meeting and getting to know other Star Coach guests and clients who were all perched on the coach’s observation deck just off turns 3 and 4. By the time Friday’s truck race was over, Lofton and College Complete earned themselves a bunch of new fans. The College Complete team celebrated into the night with everyone at Star Coach as well as many of the fans and look forward to joining up with them again in Dover next week. Star Coach Race Tours, is your premier resource for all-inclusive travel packages at NASCAR race events. At Star Coach Race Tours we pride ourselves in the ability to deliver a turn-key, no hassle, race tour for a variety of NASCAR, IndyCar and other race fans. Our all-inclusive race packages include luxury tour bus accommodations, infield race tickets, premium infield campsites, all meals and snacks, alcoholic and non-alcoholic beverages, and airport transfers. Enjoy the amazing views of NASCAR competition from our rooftop race decks that make you feel like you are in the center of the action. Our fleet of luxury motor homes is the perfect solution for relaxing in an infield during your race tour. All coaches are designed to make your race vacation a hassle free experience. Avoid the long lines and crowds in the grandstands and long commutes from hotels. Our luxury buses allow you to be in the center of the action all weekend but still provide an exclusive level of privacy due to the floor plans and construction.